As western leaders push for negotiations between Israel and the Palestinian Authority, urging Israeli concessions - including the release of convicted terrorists - the PA leadership is continuing in its longstanding tradition of honoring terrorists who murdered Israeli civilians, report Itamar Marcus and Nan Jacques Zilberdik of Palestinian Media Watch. PMW points to a picture that appeared on an official Fatah Facebook page, glorifying five of the suicide bombings for which Abdallah Barghouti prepared explosives, which killed 61 "Zionists." The graphic was posted by the administrator of the official Facebook page of the Enlistment and Organization Commission of Fatah. Arch-terrorist Barghouti was honored as the "brave prisoner" and his attacks as "self-sacrificing activity" and "Martyrdom-seeking operations." "Martyrdom-seeking operations" is the Palestinian euphemism for suicide bombings. Barghouti is serving 67 life sentences for preparing explosives for terror attacks in which 67 people were murdered – Sbarro restaurant (15 killed, Aug. 9, 2001), Sheffield Club (15 killed, May 7, 2002), Moment Café (11 killed, March 9, 2002), triple attack at Ben Yehuda pedestrian mall (11 killed, Dec. 1, 2001), Hebrew University (9 killed, July 1, 2002), and Bus 4 in Tel Aviv (6 killed, Sept. 19, 2002). 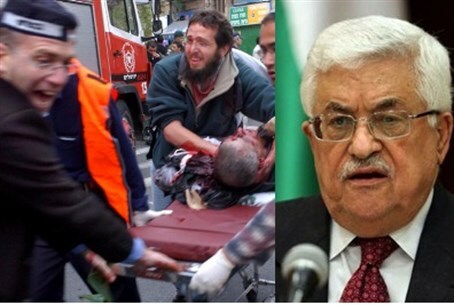 Following PMW's exposure of the visits this past May by PA TV to the homes of terrorist Barghouti and two other arch terrorists who between them are serving 166 life sentences, PA TV criticized PMW saying they are not terrorists but "heroes" and attacked PMW for calling them "terrorists". Palestinian Authority gets a "free pass"
Israeli commentators have long pointed out that whilst the Israeli government is subject to widespread pressure to make concessions to encourage "good will," no such requirements are made of the Palestinian Authority. Following the European Union's announcement that it would boycott Jewish communities in Judea, Samaria, the Golan Height and parts of Jerusalem, the Anti-Defamation League accused the EU of giving the PA leadership a "free pass" to continue inciting and encouraging violence against Israelis. Foxman called on the EU to end its “long-standing habit of not holding the Palestinian Authority responsible for its actions and inactions that are unequivocally obstacles to peace." Those "actions" included the constant stream of antisemitic incitement by official and unofficial organs of the PA. Israeli politicians and commentators will no doubt be waiting to see what reaction - if any - western leaders will have to this latest incident.